One of the final assemblies to look at on my Last Action Hero is the drop target bank. 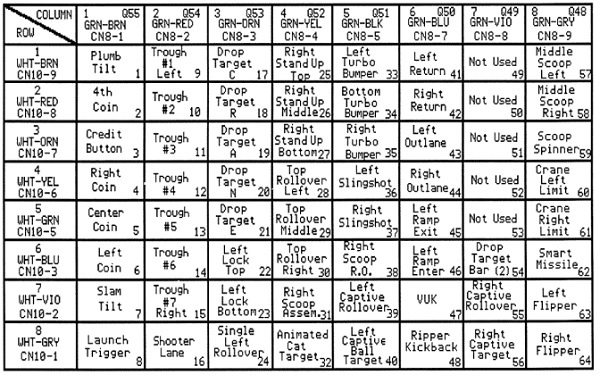 Located on the left side of the playfield, it contains 5 targets, spelling the word crane. It’s use for the skill shot to begin each ball and also to activate the crane during the game. It gets a fair bit of use during play and I have no doubt can do with a clean. 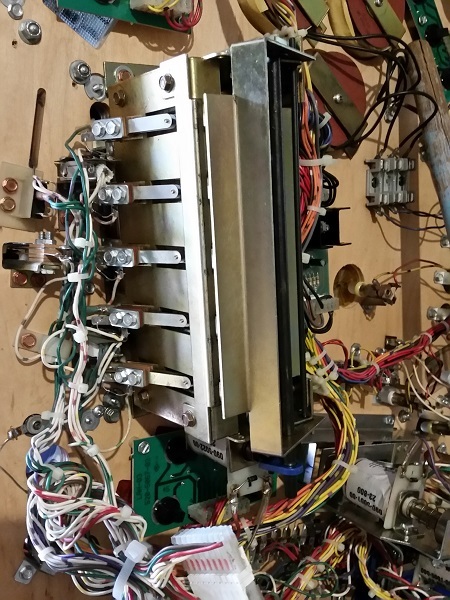 Following on from where my previous update finished, I want to get the remainder of the playfield components cleaned and installed once again. I got through a lot in the last update, with just the ramps, rails, crane and tar pit to go. First thing to look at in this update is the large clear ramp at the top of the playfield. It makes sense to get this on first, as the rest can then be installed around it. The ramp had been set aside a few days ago, waiting for it’s turn to be cleaned. There are a few things attached to it and I plan to remove and clean also. Thankfully the plastic has not broken and it simply needs a good clean. 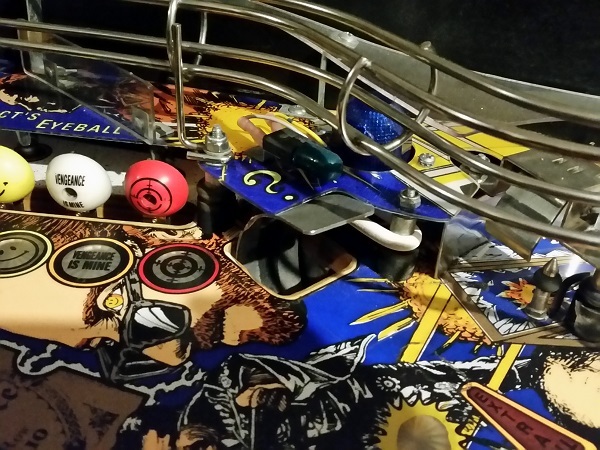 Before I stripped and cleaned the playfield on my last action hero, I had a phantom ball drain occur a few of times. When I say phantom drain I mean the flippers go dead, end of ball music plays, you are awarded a bonus and then the next ball is served up. 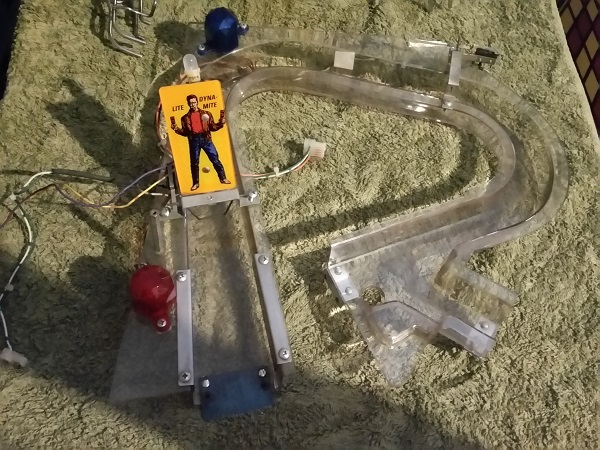 I suspected at the time it could be a trough switch needing adjustment and since I was going to look at the ball trough as part of the playfield cleaning, I didn’t bother looking closer at it. Fast forward to post cleaning. I had the playfield back together and began to test. After a couple of games I noticed that the phantom ball drain was now far more common – in almost every game it would occur. I also began to notice other side effects where some playfield features would be activated without hitting the corresponding switch. After some additional testing during a game, I found a direct relation between the phantom drain and the “R” drop target. When this target was hit, it would instantly believe the ball had drained, award a bonus and continue to the next ball. Well it didn’t take long. Only a few weeks into owning a machine that I didn’t plan to do any work on, and am going to strip the playfield for a solid clean. Having had a much closer inspection now, there is a lot of dust and dirt at the top of the playfield, along the ramps and on the plastics located up there too. I really want to get it into a clean state – a base line – that I can reference to know when the machine was last given a service and deep clean. Since I’ve already worked through a number of the assemblies below the playfield, I want to give the playfield itself similar attention. While I’m doing that, I can clean the individual parts on the playfield and get fresh rubber all over it. Naturally, that means I won’t be able to play it for about a week – but it’s task well worth doing. I’ve been having a lot of fun playing my Last Action Hero since it’s arrival. 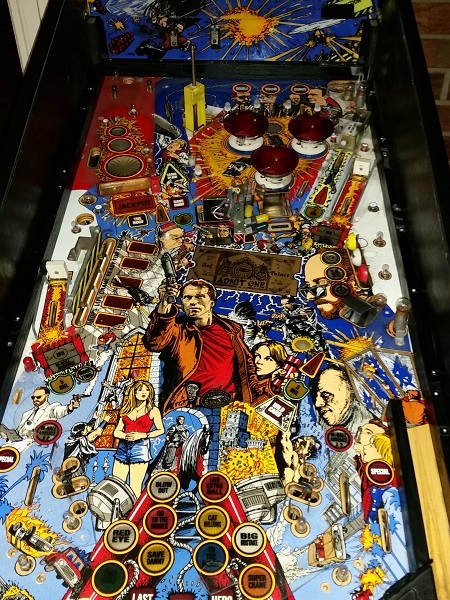 I’m not sure how it rates as a game among the pinball community, but I’ve found it to be really enjoyable and it’s a welcome entry to my Pinball fleet. My previous update focused mostly on small cosmetic things but in update #2, I’m starting to look at cleaning the assemblies to get the game running at an optimal level. First thing on my radar this time is the single scoop, located on the right side of the playfield.